The super sturdy Ladder-Max is professional grade, but homeowner friendly. It provides 19" of standoff from gutters, roofing and walls while stabilizing your ladder with arms that reach 36" from tip to tip. Our signature orange tips are made in the USA of non-marring heavy duty plastic and provide four points of stable contact to protect you from sideslip and to protect the surface on which your Ladder-Max standoff rests. The standoff distance also allows you to work in a natural, unstrained position. You're able to reach farther more safely. 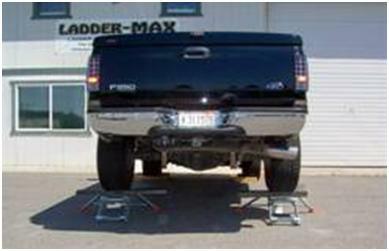 The Ladder-Max standoff is constructed in the USA of rugged, durable, rust-resistant steel and is built to last. It has the highest duty rating for type 1AA ladders with a special duty rating of #375. We conducted additional testing in a battle which pitted Ladder-Max against a 4X4 truck. Click here to see who won! Ladder-Max fits all major aluminum, wood and fiberglass extension and articulating ladders including Werner, Louisville, Howard, Gorilla, Little Giant, Green Bull and others. Ladder Max slips over 2 of your ladder's rungs, which should be 12 inches on center. 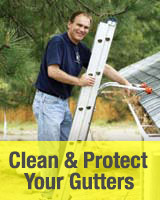 Ladder-Max makes your ladder SAFER! Ladder- Max standoff stabilizer is OSHA compliant and structurally built to withstand the weight of placing the stabilizing arms directly on a roof while stabilizing and supporting the weight of the individual on the ladder and still providing the necessary standoff distance to protect gutters and roofing materials from being damaged by the ladder leaning against them. To easily access the roof, the Ladder-Max is placed on the 4th and 5th rungs of an extension ladder, allowing the other rungs of the ladder to extend 36" above the roof surface. The user can then climb the ladder up to the roof and, while holding onto the ladder rails which extend past the roof, side step onto it. The pins that hold the Ladder-Max in place are not structural and only intended to hold the unit in place on your ladder until it is leaned against the bearing point, such as a wall or roof. Once the standoff and ladder are in place and there is weight on the ladder it will not move, provides great stability and prevents side slip. Made of steel, the Ladder-Max provides the strength required to handle a true work load and is built to last. Ladder-Max's 19 inches of standoff lets you stand at a natural position. You can reach further with less effort. Designed and certified for roof placement, Ladder-Max will reduce your business liability by eliminating the need to lean the ladder against eaves, gutters or roof edges. 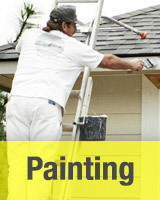 Ladder-Max will save you money by eliminating damage normally attributed to ladder placement. Approved for use with ladder jacks. Heavy duty non-marring plastic tips. Ladder-Max is made in the USA! There is another ladder accessory option for those people who are not comfortable side stepping onto a roof. When the Ladder-Max standoff/ stabilizer is combined with the Safe-T Ladder Rail extensions, the user can step through the safety rails onto the roof without side stepping while still protecting gutters and roofing materials from damage. Both methods are OSHA compliant. 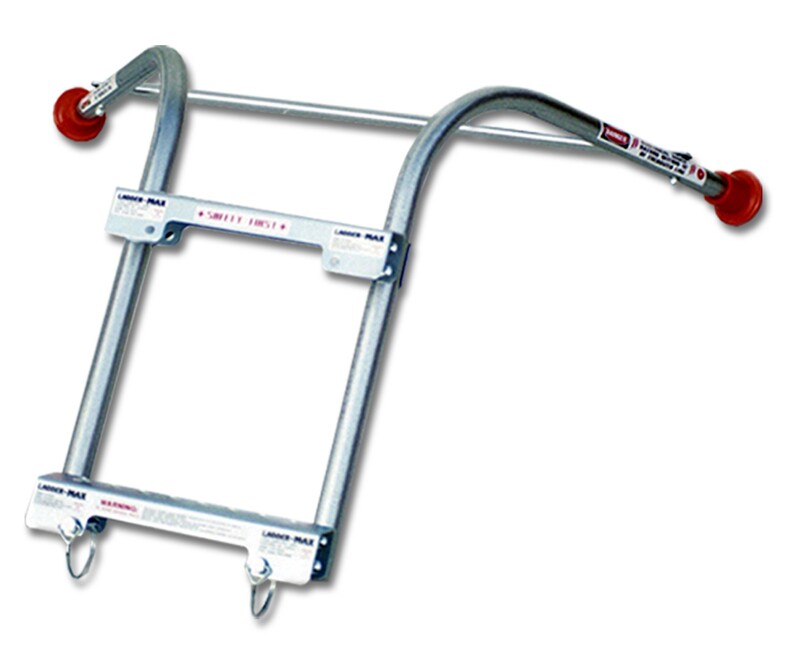 Safe-T Ladder Rails may be used on an extension ladder with or without a Ladder-Max standoff. The Safe-T Rail extensions are designed to attach to the top of the ladder side rails. They attach in seconds without tools. Protect your gutters, roof, and siding with the #1 selling ladder standoff in North America, offering 10 years of proven safety. Ladder-Max is a professional grade standoff stabilizer--the strongest, most durable standoff stabilizer system available, manufactured in the USA. Ladder-Max provides 19" of standoff from gutters, roofing and walls while stabilizing your ladder with arms that reach 36" from tip to tip. 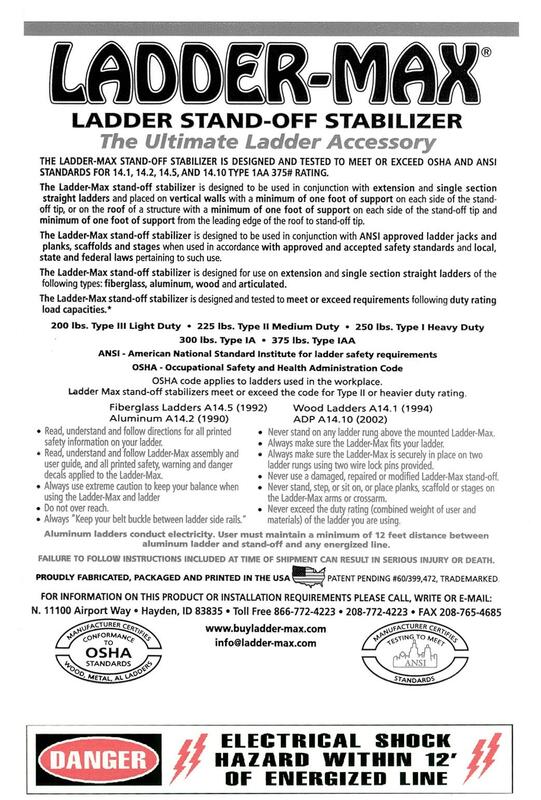 It is constructed of rugged, durable, rust-resistant galvanized steel and is built to last, with the highest duty rating for type 1AA ladders: a special duty rating of #375. Ladder-Max standoff stabilizer is OSHA compliant and ANSI certified -- the only standoff certified for direct roof placement. 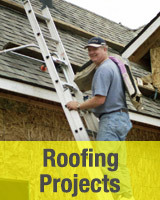 It's structurally built to withstand the weight of placing the stabilizing arms directly on a roof while stabilizing and supporting the weight of the person on the ladder. To easily access the roof, the Ladder-Max is placed on the 4th and 5th rungs of an extension ladder, allowing the other rungs of the ladder to extend 36" above the roof surface. The user can then climb the ladder up to the roof and, while holding onto the ladder rails which extend past the roof, side step onto it. 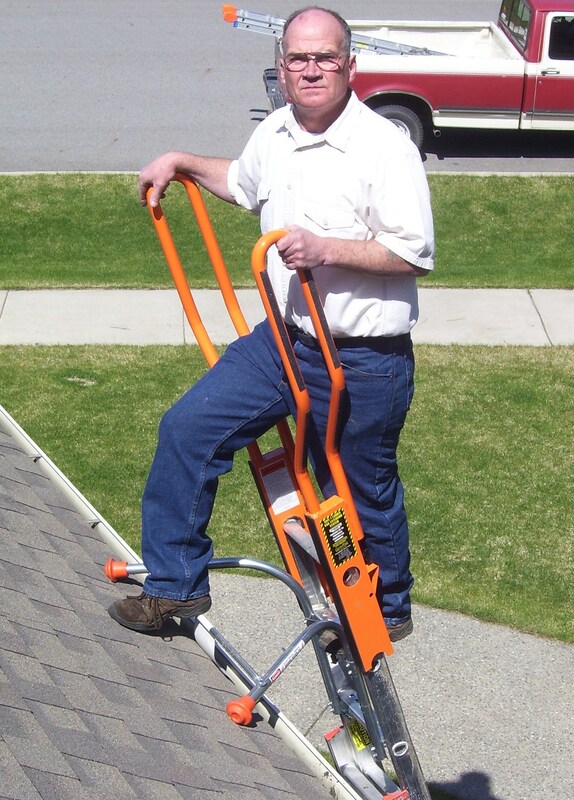 This is a MUST HAVE tool for safety and convenience, whether you are a homeowner or a professional gutter installer, painter, roofer, sider, home inspector, window cleaner, exterminator, Christmas decorator, insurance adjustor, utility worker, or any other professional who uses an extension ladder. I purchased this unit because we just had new gutters installed and didn't want to scratch them up. The added bonus is that this unit makes your ladder very stable and it is easy to get onto the roof. I am 66 years old now and I need all the help that I can get. Do yourself a favor and get this stabilizer, you won't be sorry! used it in a windstorm, perfectly stable. Easy to install on ladder. No worries about damaging eaves troughs. Everyone who sees it is surprised they did not get one years ago. Excellent value. A very nice piece. I would have rated it 5 stars, but the finishing left a lot to be desired. Too many sharp edges to cut yourself on for the price. Wear gloves when assembling. Customer service is top notch! Delivered quickly. Easy to assemble. Felt secure and safe on the ladder. 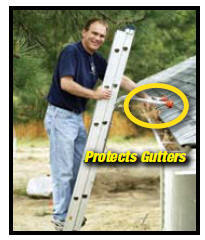 Gutters protected as advertised. Would highly recommend. Easy to assemble and Install. I was initially worried that it would not be stable since it didn’t bolt or attach to the ladder most securely, but with the ladder at the right angle it is very stable. Just make sure you put some load on the ladder so it can settle before you climb. I used it with a little giant ladder to climb onto my first story roof. I then had to pull the ladder up and use it on my sloped roof to get access to my second story flat roof that has a short sloped section. The only way I could do this without destroying my gutters and potentially falling to my death was to have a tool like this. Using the ladder max allowed me to get the right angle on the ladder and kept it more stable than having a second person holding it and resting it against the gutters. 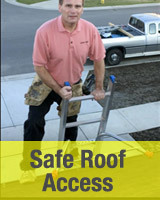 Now I can work on my roof safety without a second person. For my application makes climbing the ladder SAFER and better to do gutter work. Expensive but definitely worth it! 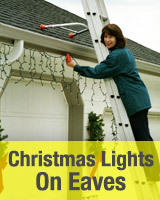 The big box stores have something similar and way cheaper, but I wanted the roof stability, and this was a LIFE SAVER by allowing me to hang Christmas lights on my extension ladder and not have ANY swaying or movement. Totally worth the cost!!! I'm super happy with the ladder max. 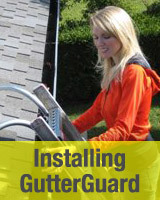 I was able to add leaf guards to my gutters without the ladder resting on the gutters. Super stable attachment, that works great!